This was the question Chris Hadfield, a Canadian Astronaut, lobbed to his TEDx audience in March 2014. I was introduced to Chris after a client sent me a video of him singing and strumming to David Bowie’s classic “Space Oddity” (38M views) while orbiting the earth at five miles per second as the first Canadian commander of the International Space Station in 2013. I’ve always been enraptured with the NASA space program. As a kid I remember watching President John F. Kennedy on our black and white television in 1961 challenging the engineers to land an American on the moon before the end of the decade. I remember John Glenn being the first American to orbit the earth in 1962. And of course I vividly remember July 20, 1969 while watching Neil Armstrong, the first man to set foot on the moon at 10:56pm ET, utter the memorable words, “That’s one small step for man…one giant leap for mankind.” JFK’s vision became a reality. “In the astronaut business we have a saying which is, there is no problem so bad that you can’t make it worse. And I was outside on my first spacewalk (pic above) when my left eye went blind. And I didn’t know why. Suddenly my left eye slammed shut, and great pain and I couldn’t figure out why my eye wasn’t working. And now I was completely blind outside the spaceship. Why would we take that risk? Why would you do something that dangerous? But the real question is how do you deal with the danger of it and the fear that comes from it? How do you deal with fear versus danger? The danger is entirely different than the fear. How do you get around it though? How do you change your behavior? So what’s the scariest think you’ve ever done? Maybe it’s spiders? Well, next time you see a spiderweb, have a good look, and make sure it’s not a black widow spider, and then walk into it. I guarantee you, if you walk through a hundred spiderwebs you will have changed your fundamental human behavior. Your caveman reaction, your natural panicky reaction doesn’t happen.You can apply this to anything. 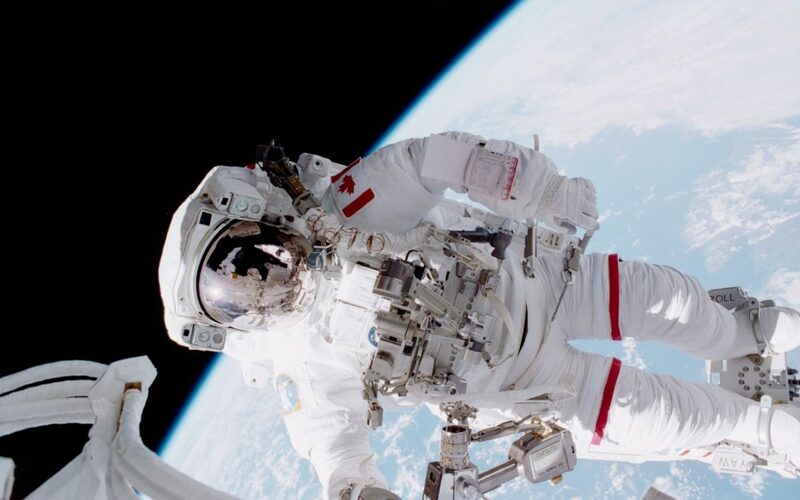 If you’re outside on a spacewalk and your blinded, your natural reaction would be to panic. Instead you kinda look around and go: Okay, I can’t see, but, I can hear I can talk. It’s not nearly as big a deal. Actually, if you keep on crying for a while, whatever that guck was that’s in your eye starts to dilute and you can start to see again. But the key to that is, by looking at the difference between perceived danger and actual danger. Where is the real risk? What is the real thing you should be afraid of? Not just a generic fear of bad things happening. Think about it. How often do you wake up asking how you’ll put yourself into danger? Not often, I’m sure. What about doing something that scares you? Now that’s something you can do more of. In recent years I’ve taken my first 100 foot scuba dive, moved to a foreign country, and danced live in front of hundreds of strangers. Each of these events landed on different levels of the scary scale. Though were they dangerous? That depends upon your perspective. From my perspective, danger means there’s a potential of doing physical harm to my well being. When I went scuba diving to the depths of 100 feet the first time, I was with my instructor who is one of the most experienced divers in the Philippines. He’s a Captain in the Philippine Auxiliary Coast Guard. He trains army personnel how to scuba dive. He’s manned search and rescue teams in the open waters of SE Asia. And he’s been teaching and diving for almost 40 years. Was it scary? You betcha. Dangerous? Not in the least. Moving to a foreign country is another scary chapter of my life. I literally watched hundreds of videos, read as many blogs and posts in expat forums, as well as spoke to numerous expatriates who were looking for something more from their life and transferred overseas. What scared me the most was figuring out how to maneuver and acclimate in a nonnative environment. Scary but not dangerous. Now you might find this odd or difficult to understand. Dancing on an elevated runway in front of hundreds of strangers for the purposes of raising money for charity was the scariest thing I’ve done in the recent past. In fact, I’d venture to say this event broke the scary meter scale. Why? My perception of my dancing skills were such that I’d make a fool of myself. Akin to an octopus moving around on roller skates. My perception of my reality couldn’t be more off base. Currently I’m leading a class at Coach University called Guiding Principles. The seventh principle is People Live From Their Own Perception. The principle states: An inclusive, present based perception of reality is the platform for effective action. Peoples perceptions of themselves and their world are real. Their reality. A reality made up filters encompassing, people, places and things. A reality that’s built on a foundation which has taken decades to cure and solidify. A reality, a fortress so impenetrable, it appears impossible a change is possible. One of my goals as a coach is to partner with clients to help them widen their frame of reference so that their perception of the present as well as choices available to them are expansive and empowering. I’m able to do that by constantly challenging myself. Feeling the fear and entering situations that scare me. Situations which expands my thinking. Situations which allow new seeds to germinate. Situations which widen my frame of reference and refine my view and orientation of what’s possible. In the end, we need to return to and contemplate Chris Hadfield’s thought in regards to real vs. perceived danger. What’s the real risk? What’s the real risk of you moving forward? What’s the real risk if you decide to continue to survive in your safe impervious world of status quo?